Vicente Manansala's "Cumbancheros," an oil on panel, is a gift from Jovita and Carl Zimmerman to the Honolulu Academy of Arts for its Filipino gallery. The work is one of two paintings the Zimmermans contributed. Hawaii's Filipinos, many of whom were born here, have varying levels of exposure to the culture of the homeland. Many of the third and fourth generations are probably more American than Filipino in culture and attitudes. What they know of the Filipino culture seems to be largely dancing, singing and food. Those born in the Philippines, like me, may have stronger ties to the homeland that make them more familiar with Filipino folk art. Unfortunately, the Honolulu Academy of Arts' Filipino gallery seems to draw little interest from either group. I hope that will change. George Ellis, former director of the academy, founded the gallery in 2003, alongside the academy's other Asian collections representing China, Japan, India, Korea and Southeast Asia. Ellis became fascinated with Filipino art after he discovered a wooden serving spoon topped with a carved human figure, done in an early primitive style. His attempts to identify the object revealed there was very little information available, which stimulated further research efforts. His energy and dedication resulted in the establishment of the only permanent Filipino art gallery in the United States. At the outset, it was necessary to employ a historical approach and exhibit folk art from various regions of the country, including woodcraft, embroidery, jewelry, costumes and furniture. But the gallery has now moved onto the 20th century and modern art. The centennial celebration of Filipino immigration to Hawaii seemed an appropriate occasion for my husband and myself to enhance the collection with a contribution of two paintings that we acquired decades ago. 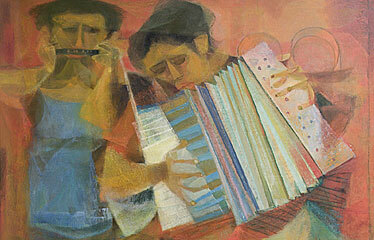 One, an oil by Vicente Manansala, is called "Cumbancheros," about long-ago street musicians who were sometimes romantic serenaders, particularly in the provinces. Manansala was sent to Paris for art training by a benevolent patron and his painting reflects his interest in cubism, showing flat cubist heads and squarish figures. Romeo V. Tabuena's watercolor, our other contribution, is a rural scene depicting carabaos, the farmers' work horses, in effect. Tabuena, a natural painter, was untrained and unfortunately died young. He romanticized farm life and was a true representational painter. Both men were prominent midcentury Filipino artists and these pieces enhance a collection that had primarily comprised folk art of earlier centuries. The current director of the academy, Stephen Little, remarked that the Filipino gallery "has created new opportunities for the academy to work with the Filipino community on a wide variety of new programming." Little has appointed Ephraim Jose, an art conservator from the Philippines, to the academy staff, strengthening the academy's ties to the Filipino community. Jose is retouching parts of the Tabuena painting that have faded since I purchased it 50 years ago as a homesick student on the East Coast. Filipino artistic achievements have until recently gone largely unappreciated in Hawaii. The academy's Filipino gallery is fulfilling a need to bring those achievements to the attention of Hawaii's people.